Paper Figure ~Maid Version~ is papercrafts of the maid versions of the characters that appeared in our animated production ModelKirariX 3. * This product includes small parts and complicated procedures, so please be aware that this is not a product for beginners. * This product is intended for the general public, but please be aware that it contains parts for the naked torso, so please be careful when buying. You can see pictures of the finished versions and get sample downloads by visiting our homepage. Please check it out before you buy! This was a great model magnificently made and love how it has optional parts also the detail is amazing. Although it is hard to make due to many pages and details it is worth spending the time to build it and display it. Although the extra options will require more paper to actually build the other variations thank goodness it was a file and not actual kit or else I would have to get another kit or make copies. It includes .pdo files which help a lot when building the model only flaw is that the model has lines and there is a password on the .pdo's and I can't change the textures or remove the lines. There are also parts in the .pdo files that are not necessarily used but int eh model shown in the image but it is needed in making the other variations. 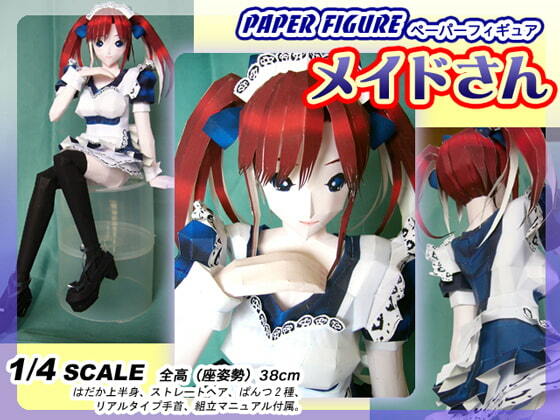 if you like building 3d paper models aka papercraft this is a model that is completely worth getting. Scheduled release Dec. 1, * Release schedule subject to change.